The fate of the V1 Immunitor, which is currently being taken by 60,000 HIV+ people in Thailand and some 5,000 abroad with some hopeful results, is in the hands of the Thai health authorities who continue to dismiss it as a potential therapy in a land stricken with AIDS infecting one million people. Last week, the Thai Food and Drug Administration sought to have its manufacturing and sales licence revoked, claiming V1 to be a sub-standard product and accusing its manufacturers of misleading the public. THEY came clutching at straws. Emaciated and weakened, many with skin lesions and fungal infections, their bodies bore the assault of a disease that had claimed over 28 million lives. In scores, they came, some being carried on stretchers, to the Bangpakong clinic located in Chachoengsao province in the outskirts of Bangkok. The antidote - the V1 Immunitor, an experimental therapeutic vaccine in the form of pink pills, touted to be the first of its kind in the 20-year war against the AIDS epidemic. I went to Bangkok to see for myself people living with AIDS who have taken V1. I wanted to investigate if indeed the claims of the first effective AIDS vaccine were true or if the opponents of the controversial V1 were right – that V1 was “useless” as the then Centre of Communicable Diseases director-general Dr Samsong Rakpao had said, and a scam as asserted by AIDS NGOs in Thailand. I met Sirpai Poontavee, 31, from Prachinbun district and her eight-year-old daughter, at the V1 Immunitor clinic. They had come in a taxi to get their monthly supply of the oral vaccine. The clinic, across the road from the V1 manufacturing plant, is located in a bleak, sun-scorched industrial park dotted with characterless white buildings. The odour of burnt cocoa from a nearby chocolate factory wafted into the clinic as patients took turns standing on the weighing machine to have their weight charted and their medical histories recorded. A mother of two, Sirpai discovered her HIV-positive status five years ago. A housewife then, she was infected by her husband through sexual transmission. Speaking through a translator, she said she started having AIDS symptoms about the time when her husband died of AIDS two years ago. Her two daughters were also infected but she was too poor to afford antiviral drugs, the standard treatment for AIDS. Sirpai Poontawee and her eight-year-old daughter Priyanod Muangthai at the V1 Immunitor clinic in Bangpakong. Sirpai started taking V1 pills two years ago after being told of V1 by her friends. “My children used to have skin disease. They were weak and they were sick all the time. I worried for them. But now they have normal lives. They go to school like normal kids. Look at my skin now and the colour on my face. My friends don’t even believe I have AIDS,” said Sirpai, holding her eldest daughter, Priyanod Muangthai, 8. Both were a picture of health. Sirpai continues to take one pill a day, and fed the same amount to both her children. Another patient, Anan Ketnork, was near death when he took V1 and has resumed normal activities since. A wiry young man in his late 20s, Anan could not walk when he came to the V1 free distribution at the First Provincial Police Headquarters in Bangkok in 1999. The event attracted broad media coverage. Displaying symptoms of full-blown AIDS, Anan was dazed and disoriented when he was wheeled into the police station that day. Images of his emaciated frame slumped on the wheel chair were splashed in the newspapers and aired on prime time news the following day. “I was told by the doctor that I had fungus in my brain. I took herbal medications and after that I couldn’t eat or swallow or get up and I had this constant terrible headache. I also lost a lot of weight. I felt like I was dying,” he said. Anan, who used to work in a furniture factory, said he was infected by his wife who had received several blood transfusions as a result of massive blood loss from a miscarriage she had in 1998. Although infected earlier than Anan, his wife had not shown AIDS symptoms so the responsibility of caring for the family fell on her. “I was never unfaithful to my wife so we think it was the blood transfusion. At the time when I was sick, my wife was earning 90 baht (about RM9) a day shelling oysters. She had to borrow money to pay for my medication and support the family,” he recounted. Anan said he was given 14 free tablets and after taking them for a mere one week, he started to regain his strength. He was able to sit up unassisted, feed himself and his appetite returned, he said. He continued taking them and was able to do light work around the house after two months. “I still could not ride my motorbike or run, but I gained 11kg, from 41kg to 52kg. My headaches stopped. I am still taking V1 and I can work like a normal healthy person. I ride my motorcycle now to pick up the tablets from Chonburi,” he said. Sirpai and Anan are among thousands of people who have benefited from the vaccine developed by home-grown Thai pharmacologist Vitchai Jirathitikal, a graduate of Mahidol University. The second son of a family of pharmacist, Vitchai had gone against his father’s wish to work on HIV, joining scientists throughout the world in the race to find a cure for the AIDS epidemic. Working in his family’s lab at Bangpakong, Vitchai developed the V1, V2, V3, and V4 for different ailments by using a “new technology” that involves crystallising heat-inactivated antigens (viral, bacterial or fungal) in magnesium chloride, and packaging it in a pill coat that resisted the stomach’s digestive action. Vitchai Jirathitikal (right) with a patient at the Bangkapong V1 clinic. Vitchai said V1 had been tested for acute toxicity in mice and it was found that only if a dose equivalent to 2kg of V1, or 2,200 pills a day, was taken by a 70kg human could V1 result in harm. Even ordinary table salt can cause harm if 2kg of salt is consumed in a day, he said. Other than having minimal side effects, he pointed out that V1 is affordable and its administration simple – just pop the pill – compared to conventional vaccine, which has to be injected. In Thailand, with one million people infected by the virus (one in 60 people in a nation of 63.6 million) and close to 300,000 killed by the disease, managing AIDS is a grim reality. Last year, with some 29,000 new infections, AIDS has become the leading cause of death. However, only 5% of the one million infected people had access to antiretroviral drugs which cost between 10,000 baht and 30,000 baht (RM1,000 and RM3,000) a month. This in contrast to a month’s supply of V1 pills which costs 900 baht (RM90), far lower then even generic antivirals, which are sold at a subsidised rate by the Government Pharmaceutical Organisation of Thailand at 1,800 baht (RM180), a price still beyond the reach of most people living with HIV/AIDS in Thailand. Currently, the Thai government provides subsidised antiretroviral treatment for 10,000 patients. But with a whopping 9.2bil baht (RM920mil) aid from the Global Fund for AIDS, Tuberculosis and Malaria approved this year, the Public Health Ministry announced that free medical aid would be extended to cover all those living with AIDS by 2007. Even then, with the infection rate of 29,000 new cases a year and 55,000 AIDS-related deaths last year, the scenario on the ground is still bleak. Antiretroviral drugs have high toxicity, causing severe side-effects, and patients invariably develop resistance to it after two years. As a routine, hospitals send patients with terminal, full-blown AIDS to Buddhist temples to die. 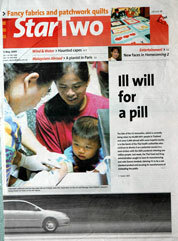 When the V1 pill caught the attention of the media in 2001, it received mixed reactions from various quarters. The free distribution campaign to promote V1 was viewed with suspicion by AIDS organisations and public health officials. They had accused the promoters of V1 of raising false hope and regarded the free distribution as a publicity stunt on an unproven drug which only had a food supplement permit. Shortly after the distribution campaign, including large stadium handouts in Bangkok, the V1, which had earlier received its food supplement permit on Oct 15, 1999, from the Thai Food Drug Administration (FDA), was deregistered on June 5, 2001. But patients who have been taking V1 came out in full force in a demonstration to demand for the permit to be reinstated. A week later, the permit was reissued. A day before the permit was reissued on July 13, 2001, the Bangkok Post reported that Prime Minister Thaksin Shinawatra gave his full backing for research on V1 pills. Thaksin was quoted to have said that some officials were adhering too closely to international rules that were preventing Thai researchers from experimenting with AIDS vaccines. “We should give Thai people opportunities to develop a vaccine,” he said. The free distributions had the patronage of the Salang Bunnag Foundation, which is headed by a controversial figure in Thai politics. Police General Salang’s involvement with V1 turned AIDS activists and the foreign press against V1. He was remembered as the man who commanded the police and paramilitary in the Thammasat University massacre of pro-democracy supporters in 1987. In 1996, he ordered the execution of six drug dealers in his custody, which was caught on film. Although V1 manufacturers had cut off ties with Salang since 2001, the damage had been done. With the bad press and attacks by powerful NGOs, some high-level public health officials had joined the crowd in denouncing V1. They claimed that cases of patients getting better were mere anecdotal evidence. Since then, V1 has undergone clinical trials and research into its safety and efficacy. Outside of Thailand, it is gradually gaining recognition in the scientific fraternity. With publications in the Electronic Journal of Biotechnology, and peer-reviewed journals such as HIV Clinical Trials and Vaccine, a leading international journal in the field, the V1 has received attention from countries hardest hit by AIDS. Eleven countries in Africa are currently testing the V1, with 10 more countries having plans in the pipeline. V1 Immunitor scientific director Dr Aldar Bourinbaiar said the results of V1’s efficacy as a potential therapeutic and preventive vaccine far surpassed any drugs or vaccine that have been developed since HIV was discovered two decades ago. Dr Bourinbaiar is one of the pioneer researchers in AIDS drug and immunology and has a total of over 20 years of experience in patenting work and working in multinational pharmaceutical companies and top labs in the world. He has six patents and over 100 publications, including five books to his name in AIDS research. “We are seeing an 85% efficacy rate. That has never been seen in any AIDS drug or vaccine,” he said. In a paper, published in HIV Clinical Trials (Thomas Land Publishers Inc, 2002), 40 patients tracked in a six-month survey experienced an average weight gain of 2.2kg. They also registered a mean increase of 18% and 16%, respectively, in their absolute CD4 and CD8 cells, a measurement of white blood cells responsible for warding off infections. For end-stage patient survival rate, V1 has kept alive 56.6% of the patients, while those who did not take V1 were all dead within nine weeks. The research on 117 terminally ill patients at the Wat Phra Baht Nam Phu, the largest Buddhist temple in Thailand that cares for dying AIDS patients, was published in HIV Clinical Trials last year. “If you are a terminal AIDS patient, and you took V1, instead of being dead within two months, you have a more than 50% chance of surviving past two months. Your chance of being alive is still in the 15% range even after one year. “No antiviral drug in the world today can match that effect. The most advanced antiviral combination therapy in full-blown AIDS patients showed that 16% of treated patients had died versus 23% of patients who were untreated and placed on placebo. That means the difference attributable to antiviral drugs was only 7%, whereas in the V1 study, which dealt with much sicker patients, the difference was between zero and 56.6% survival,” said Dr Bourinbaiar. Independent researcher Dr Orupan Metadilogkul, who was the prime investigator in the research, said one or two of the patients from the study managed to stay alive, got out of the temple and had been living normal lives. “One still visits me, and that’s after two years from the study,” said Dr Orupan, an epidemiologist, who is also the president of the Occupational and Environmental Medicine Association of Thailand. Dr Orupan is currently under investigation by the Public Health Ministry for publishing a paper on 22 cases of AIDS patients who had become HIV-negative after taking V1 between two weeks and 14 months. Her paper has been lambasted by the ministry’s permanent secretary-general Dr Vallop Thaineau as poorly done research, and he accused her of misleading the public into believing that V1 was a cure for AIDS. Dr Orupan had responded by suing him for libel. Last October, a senior medical technologist was found hanged after being blamed by her superiors for making an error in a particular HIV blood test of a patient who was taking V1. Police said they suspected the alleged suicide as a result of issues related to work at the state-run Lerdsin Hospital, where she was working. Sureeporn Limpasupalerk, 52, had found that the blood test of a HIV-infected person, named Amnuay Phawachalermsak, had become negative after taking the V1 pills. Her report was picked up by the press and made headlines. Seureeporn was questioned by the hospital board after an inquiry by the Ministry of Public Health over her test report, reported The Nation (Nov 3, 2002). A Thai language paper, the Thai Post quoted a close friend of Sureeporn saying that she had been asked by her to keep some copies of the patient’s test results and fight for fairness for her if she was to be put under further investigation. The paper quoted her friend as saying that the copies she had in hand were those of the original results, which had mysteriously disappeared from the hospital a month after Sureeporn was questioned in August. At the behest of patients who have been taking V1 and Dr Orupan, the Public Health Ministry ordered a fact-finding committee to be set up to look into the alleged suicide but the case is as good as closed. Nothing concluded, half a year later. Over the months, independent doctors who had been volunteering at the Bangpakong Clinic have withdrawn their support for the V1, alleging that they had been pressured by their superiors to drop out or have their medical licence revoked. One of them is a former World Health Organisation (WHO) consultant, who refused to have his name published for fear of repercussions. He was volunteering his Saturdays to see patients at the V1 clinic until the past March. He said: “In my 20 years of research into vaccines, I have never seen anything like that. This is the first time I have encountered such a vaccine that had such a positive impact on AIDS patients. It is better than any AZTs because for AZTs you have to take more and more, you suffer the side effects and then you develop resistance. He blamed the resistance to accepting V1 on the chauvinism in mainstream science that is Western-based. It locks the mind into a certain way of thinking, he asserted. While the V1 continued to be maligned in Thailand, ironically, it has received better acceptance abroad. So far, according to Dr Bourinbaiar, open label clinical tests are being conducted by independent doctors in 35 countries, including 11 in Africa. More needs to be done, he said, but neither the Thai government nor international AIDS funders have been forthcoming. As a result, V1 research has been criticised for the small number of subjects involved. Said Dr Bourinbaiar: “Multinationals put in billions to develop and promote a drug. For V1, Vitchai has managed to develop it with half a million. This is an exciting discovery that has laid enough groundwork for more support to come in." And on a lighter note than pure florida injury lawyer , check out the funniest trial transcript ever! If it's not serious enough of a topic, well, just pretend it's the Brit's version of florida injury lawyer ! Ju Lin, I always like your writings. You make it personal by using "I" to tell the story to the readers. I rarely see that kind of style in Indonesian newspaper. BUY CHEAP CIALIS ONLINE. LOW-PRICES ONLINE PHARMACY..! !